No matter how much attention is put on the price of gas it will still be high, at least higher by $1.50 over last year. Hybrids and other bio fuels will take a while to get into the main stream and are not replacing the millions of cars we have on the road tomorrow that run on gas and diesel. In my ideal world gas would be the same price as it is in Argentina, 12 cents a gallon, but it's not. So I decided to cruise the web looking how to stop the bleeding and beating my walet takes everytime I pull up to the pump. Check out this site I found, http://www.gasbankusa.com. 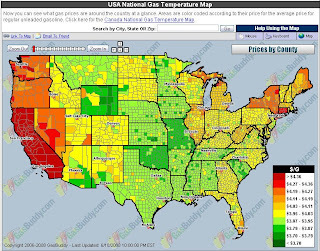 The site talks about locking in a fixed price for gas. An interesting idea and good concept as long as gas doesn't go down in price but I am not holding my breath for that to happen. GasBankUSA acctually looks like a pretty good solution to save on gas.